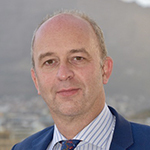 Sean Edwards is an English solicitor, formerly with Clifford Chance, and is now Head of Legal at Sumitomo Mitsui Banking Corporation Europe Limited. He takes a particular interest in trade finance matters and as Chairman of the Market Practice Committee has been closely and heavily involved in the drafting of the ITFA Guidelines and Introduction to the Primary Market. He is the author of the User’s Guide to the ITFA Guidelines and has written articles on forfaiting for all the major trade finance magazines. He is a member of the editorial board of Trade & Forfaiting Review.